Saudi Arabia's recent actions have caused a great deal of anxiety within its region. On 4 February, a military spokesman suggested that Saudi Arabia was ready to send troops ground troops to fight ISIS in Syria. A week later Saudi Arabia announced that it will send combat aircraft and soldiers to Turkey to participate in the US-led coalition against ISIS. Three days later the Saudis launched 'Northern Thunder', described as the 'largest military exercise in the history of the Middle East'. Participants from 20 countries sent troops to the manouevres run over three weeks in Hafar al Batin in northern Saudi Arabia, not far from the Iraqi and Kuwaiti border. According to a Saudi media outlet, some 350,000 troops were expected to participate in the manouevres. It is clear that Saudi Arabia was sending a strong message that it is willing to fight back. The message was aimed not at ISIS, but at Iran and its allies: Syria's Bashar Assad, Hizbullah and above all, Russia. Some conspiracy theorists even raised the speculation that 'Northern Thunder' is nothing but cover for a land invasion into Syria via Iraq or Jordan. Saudi Arabia has been very anxious about Iran's strengthening position in the Middle East. The sanctions under which it has been operating have been lifted. Russia entered the war in Syria, supporting Assad and Iran. And on its southern border, Saudi Arabia is stuck in a year long attempt to push back the forces of Ansar Allah — the Houthis — and restore the government of the deposed Prime Minister Abd Rabbuh Mansur Hadi in Yemen. Thus, there are many reasons for Saudi Arabia to try to change the situation in Syria. But can Syria do this? Saudi Arabia has been investing enormous sums of money into modernising its military. Its 75,000 strong land forces are equipped with US-supplied M1A2 Abrams main battle tanks and M2 Bradley armored fighting vehicles. Its air force has F-15S Strike Eagles, Eurofighter Typhoons, and some older Tornados. Its air defense forces are equipped with Patriot SAMs, and they also have a ballistic missile unit operating the Chinese made DF-21. 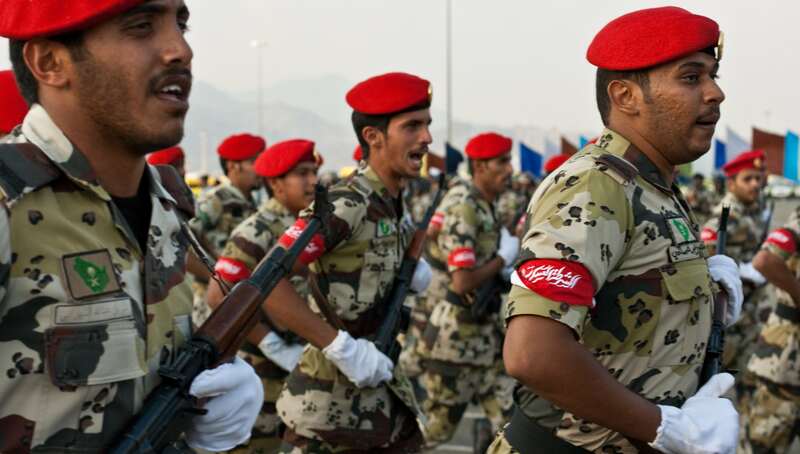 Besides the regular army there is the Saudi Arabia National Guard, a separate force under its own minister. It's as large as the regular army and probably better trained. Although it is almost entirely composed of mechanised infantry (the force does not have main battle tanks),it also has its own artillery and is now in the process of acquiring its own air arm, equipped with AH-64D Apache attack helicopters. On the face of it Saudi Arabia is a formidable military force indeed, and the prospects of such a force entering a war in Syria will chill some spines in Damascus, Moscow and Tehran. But will it? Tanks, combat aircraft and missiles are only as powerful as the people operating, maintaining and supporting them. And in this domain, Saudi Arabia has a very long way to go. Not much is known about the proficiency of Saudi Arabia's military as a fighting force. The only real war the Saudis have taken part in was Operation Desert Storm in 1991; and most of the fighting there was done by the US. More recently Saudi Arabia has been fighting in Yemen, but unsuccessfully so far. Foreign advisers speak about the difficulties in bringing Saudi Arabian soldiers to the desired combat readiness and proficiency. What is well documented is the Saudi military's level of dependence on foreign aid. Almost all the maintenance and logistic support for Saudi arms is done by foreign contractors. On top of that, there are hundreds of advisers, instructors and trainers constantly on the job. Saudi Arabia's economy is highly dependent on foreign labor (roughly a third of the population). The armed forces are no exception. That's fine, as long as the military goes out of its barracks for exercises only. But a war is something else, and on the battlefield it is difficult to rely on foreign contractors to remain with units. Some sources even maintain that a large part of the fighting in Yemen is done by mercenaries (Saudi Arabia's ally — the UAE — is recruiting soldiers as far away as Latin America). The threat of a land invasion into Syria is not over. Recent wars in the region have revived the age old rivalry between Sunni and Shia Islam. Saudi Arabia — and the Gulf states — have been frustrated with the situation in the region. But Turkey is even more so, and Ankara's military is of a different calibre. Saudi Arabia is strong enough to give some token help to any move by Turkey, but won't be able to pull much weight by its own means. Let me finish with a comment on 'Northern Thunder'. Exercises as large as 'Northern Thunder' take a very long time to plan and coordinate, and it also takes many months to gather the units together in one place. Yet, 'Northern Thunder' appeared in the media out of nowhere. (and nothing is known about it since it was announced). Where do you hide 350,000 troops? Are they really there? Photo courtesy of Flickr user Omar Chatriwala. The Lowy Institute Media Award, Kim Jong-un's statement, lessons from PNG's elections and more. Saudi Arabia’s young tyro is trying to keep up with citizens who are demanding a lot more of their rulers and system.